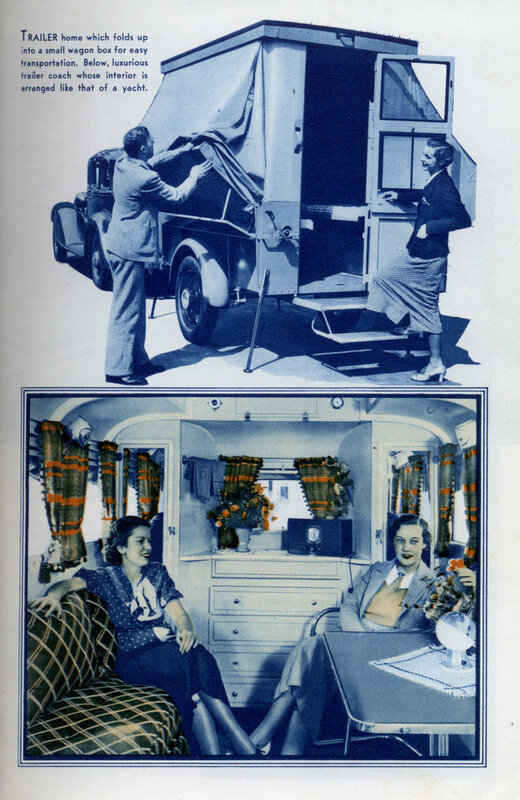 Could you image the excitement and intrigue of new 1936 mobile homes? I sure can! Lot’s of people saving up for their dream home in an effort to be free and live simply and go anywhere they wanted. It’s a refreshed dream that is still in some of our hearts some 70 years later. 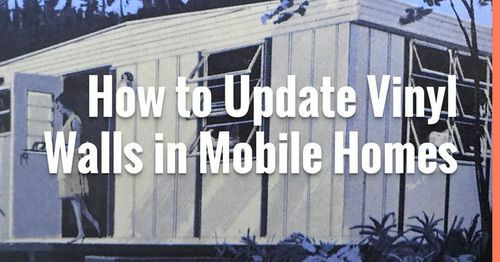 This is from another great post I found from Modern Mechanix about the mobile homes of yesteryear. 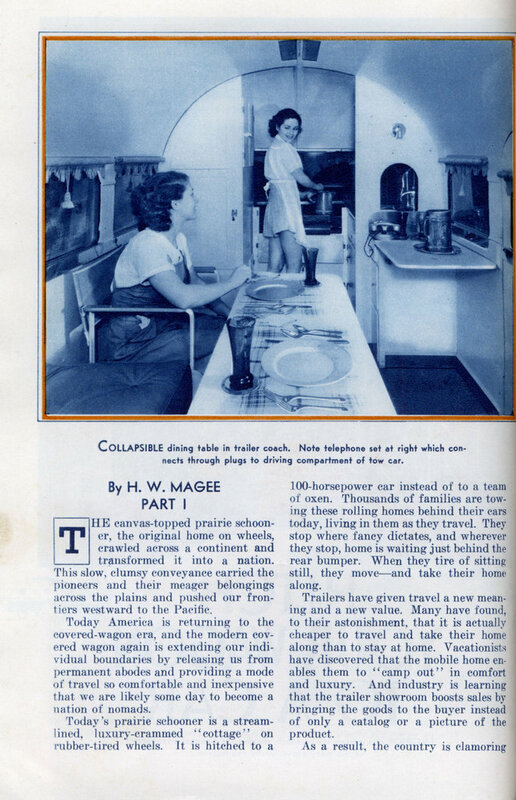 This article, Hitch Your Wagon To A Car, is a 1936 article complete with beautiful photos and great layout. Here’s the article itself along with the text below so you can read it. Enjoy! THE canvas-topped prairie schooner, the original home on wheels, crawled across a continent and transformed it into a nation. This slow, clumsy conveyance carried the pioneers and their meager belongings across the plains and pushed our frontiers westward to the Pacific. Today America is returning to the covered-wagon era, and the modern covered wagon again is extending our individual boundaries by releasing us from permanent abodes and providing a mode of travel so comfortable and inexpensive that we are likely someday to become a nation of nomads. Today’s prairie schooner is a streamlined, luxury-crammed “cottage” on rubber-tired wheels. It is hitched to a 100-horsepower car instead of to a team of oxen. Thousands of families are towing these rolling homes behind their cars today, living in them as they travel. They stop where fancy dictates, and wherever they stop, home is waiting just behind the rear bumper. When they tire of sitting still, they move and take their home along. 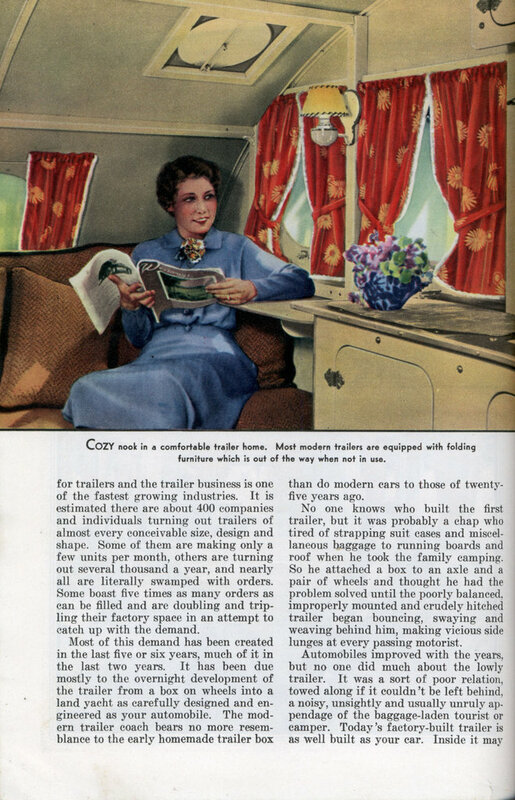 Trailers have given travel a new meaning and a new value. Many have found, to their astonishment, that it is actually cheaper to travel and take their home along than to stay at home. 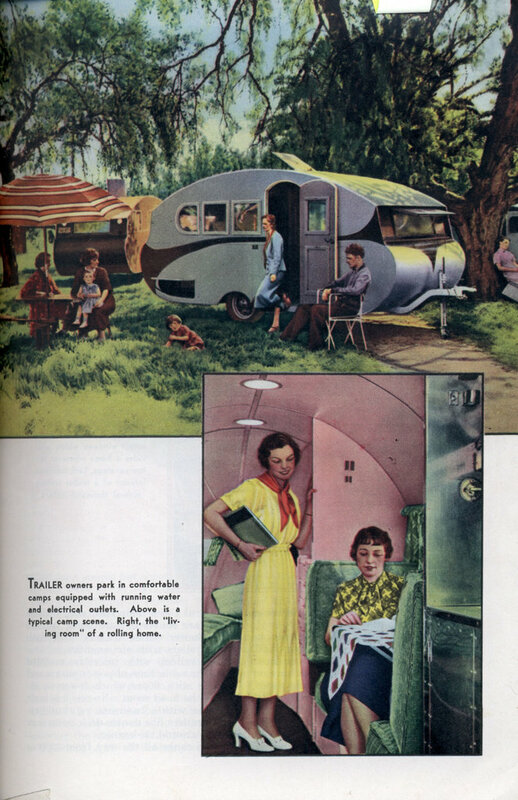 Vacationists have discovered that the mobile home enables them to “camp out” in comfort and luxury. And the industry is learning that the trailer showroom boosts sales by bringing the goods to the buyer instead of only a catalog or a picture of the product. As a result, the country is clamoring for trailers and the trailer business is one of the fastest growing industries. 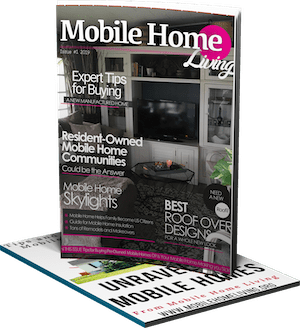 It is estimated there are about 400 companies and individuals turning out trailers of almost every conceivable size, design, and shape. Some of them are making only a few units per month, others are turning out several thousand a year, and nearly all are literally swamped with orders. Some boast five times as many orders as can be filled and are doubling and tripling their factory space in an attempt to catch up with the demand. Most of this demand has been created in the last five or six years, much of it in the last two years. 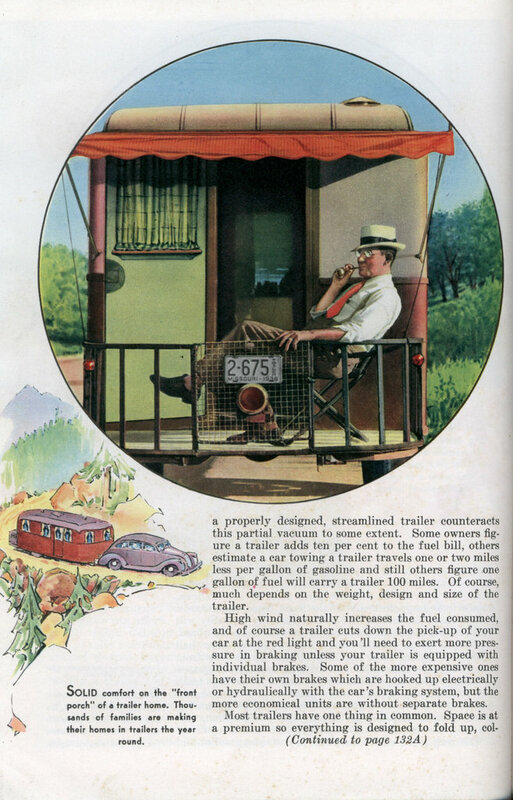 It has been due mostly to the overnight development of the trailer from a box on wheels into a land yacht as carefully designed and engineered as your automobile. 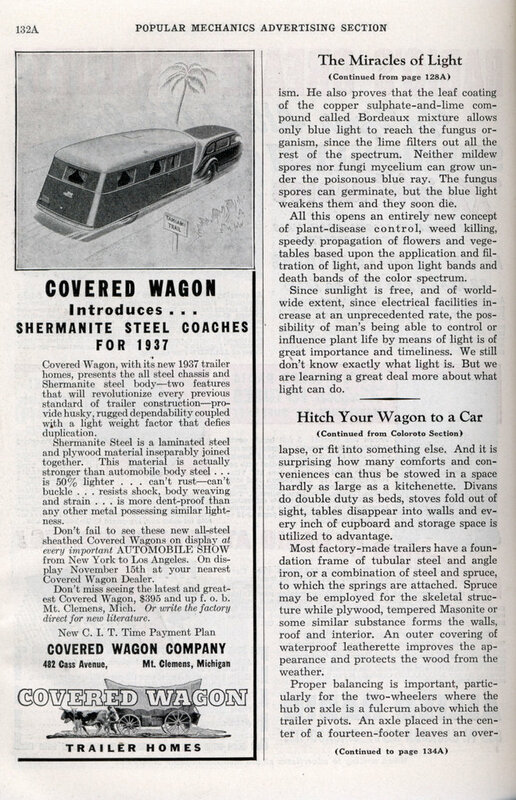 The modern trailer coach bears no more resemblance to the early homemade trailer box than do modern cars to those of twenty-five years ago. 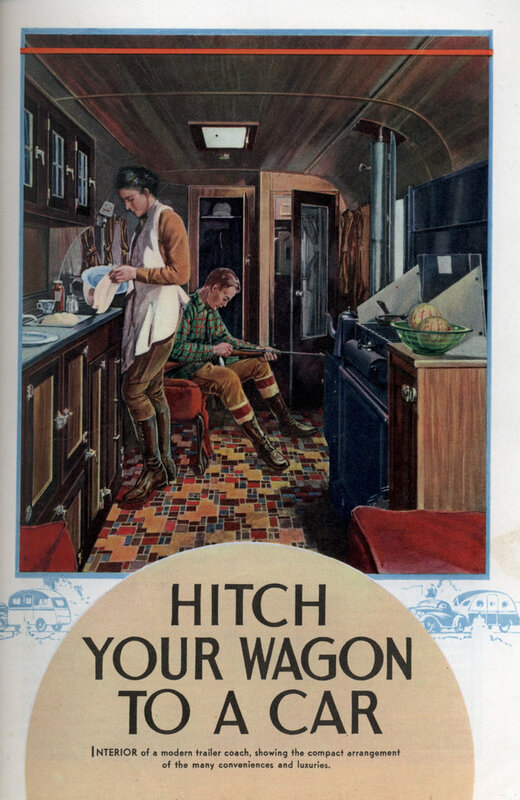 No one knows who built the first trailer, but it was probably a chap who tired of strapping suitcases and miscellaneous baggage to running boards and roof when he took the family camping. So he attached a box to an axle and a pair of wheels and thought he had the problem solved until the poorly balanced, improperly mounted and crudely hitched trailer began bouncing, swaying and weaving behind him, making vicious side lunges at every passing motorist. Automobiles improved over the years, but no one did much about the lowly trailer. It was a sort of poor relation, towed along if it couldn’t be left behind, a noisy, unsightly and usually unruly appendage of the baggage-laden tourist or camper. Today’s factory-built trailer is as well built as your car. 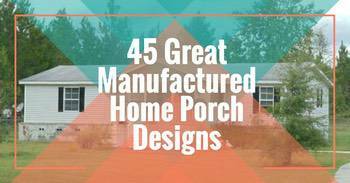 Inside it may be as many luxuries and conveniences as your purse can afford. The trailer industry is a young one and you are not limited to many standardized designs, shapes, colors or sizes. If you’re thinking, as thousands are, of buying a trailer and seeing the world, your choice need only depend on the size of your bankroll and your family. 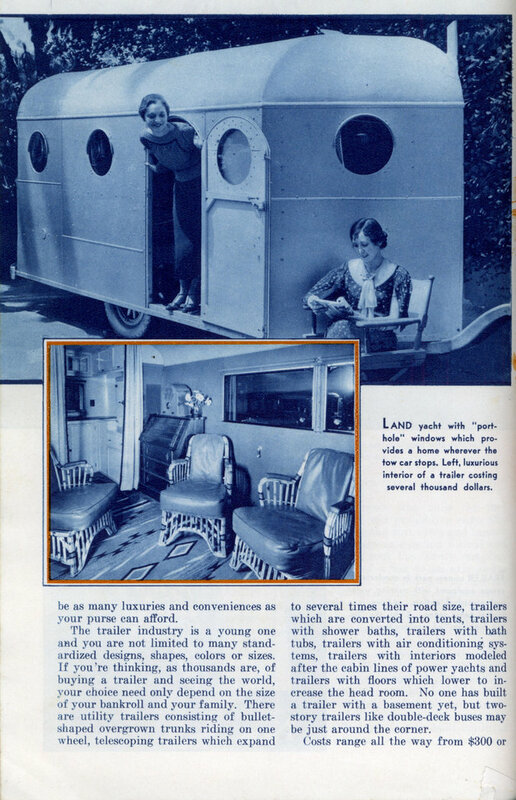 There are utility trailers consisting of bullet-shaped overgrown trunks riding on one wheel, telescoping trailers which expand to several times their road size, trailers which are converted into tents, trailers with shower baths, trailers with hath tubs, trailers with air conditioning systems, trailers with interiors modeled after the cabin lines of power yachts and trailers with floors which lower to increase the headroom. No one has built a trailer with a basement yet, but two-story trailers like double-deck buses may be just around the corner. 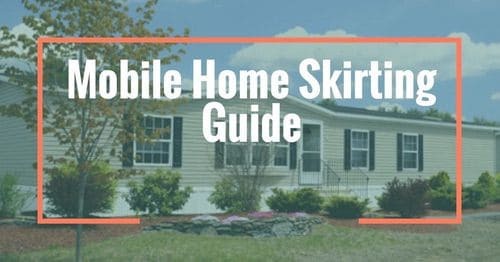 Costs range all the way from $300 or $350 for a simple but substantial home on wheels to as much as you want to payâ€”$15,000 to $18,000 for some of the deluxe jobs offering in a compact form most of the luxuries, comforts, and appointments of the finest home. Standardization, mass production, and in-line assembly probably will reduce costs as soon as the industry becomes more stabilized. Weights range from around 1,000 pounds to more than 4,000 for the big ones, and lengths run all the way from twelve to more than thirty feet, with an average of eighteen or twenty feet. A good car can tow one of these large trailers at speeds up to sixty miles per hour. Of course, the higher the speed, the higher the fuel bill, although towing a trailer adds surprisingly little to fuel consumption, considering the size and weight of the vehicle you are pulling. The drag of the air behind your car costs you gasoline and a properly designed, streamlined trailer counteracts this partial vacuum to some extent. Some owners figure a trailer adds ten percent to the fuel bill, others ( estimate a car towing a trailer travels one or two miles less per gallon of gasoline and still others figure one, a gallon of fuel will carry a trailer 100 miles. Of course, much depends on the weight, design, and size of the trailer. High wind naturally increases the fuel consumed, and of course, a trailer cuts down the pick-up of your car at the red light and you ’11 need to exert more pressure in braking unless your trailer is equipped with individual brakes. Some of the more expensive ones have their own brakes which are hooked up electrically or hydraulically with the car’s braking system, but the more economical units are without separate brakes. Most trailers have one thing in common. Space is at a premium so everything is designed to fold up, collapse, or fit into something else. And it is surprising how many comforts and conveniences can thus be stowed in a space hardly as large as a kitchenette. Divans do double duty as beds, stoves fold out of sight, tables disappear into walls and every inch of cupboard and storage space is utilized to advantage. Most factory-made trailers have a foundation frame of tubular steel and angle iron, or a combination of steel and spruce, to which the springs are attached. 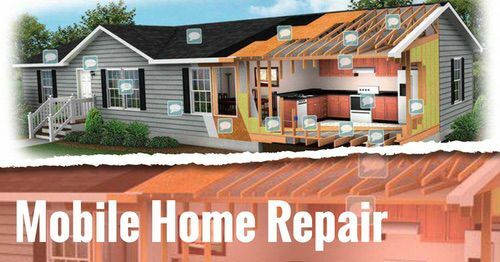 Spruce may be employed for the skeletal structure while plywood, tempered Masonite or some similar substance form the walls, roof, and interior. An outer covering of waterproof leatherette improves the appearance and protects the wood from the weather. Proper balancing is important, particularly for the two-wheelers where the hub or axle is a fulcrum above which the trailer pivots. An axle placed in the center of a fourteen-footer leaves an over-hang of seven feet which is likely to prove troublesome on rough roads because of the teetering action. Aside from scientific mounting, ease of towing also is dependent on correct hitching. Railroad type couplings, tension-spring hitches and various types of swivel couplings as well as a special wheel, spring and axle assemblies have been designed to keep the trailer “tracking” and prevent swaying. Most well-constructed trailer bodies now are insulated against heat and cold by a dead air space between outer and inner surfaces, or by employing heavy insulating foil and silvering roofs with aluminum paint to reflect the sun’s rays. A provision also usually is made for longitudinal ventilation to dispel the heat, once it finds an entrance. Interior wall surfaces usually are of plywood or some similar material with metal trim and linoleum-covered floors. Considerable electrical energy is needed to operate fans, lights, a radio and other trailer conveniences. 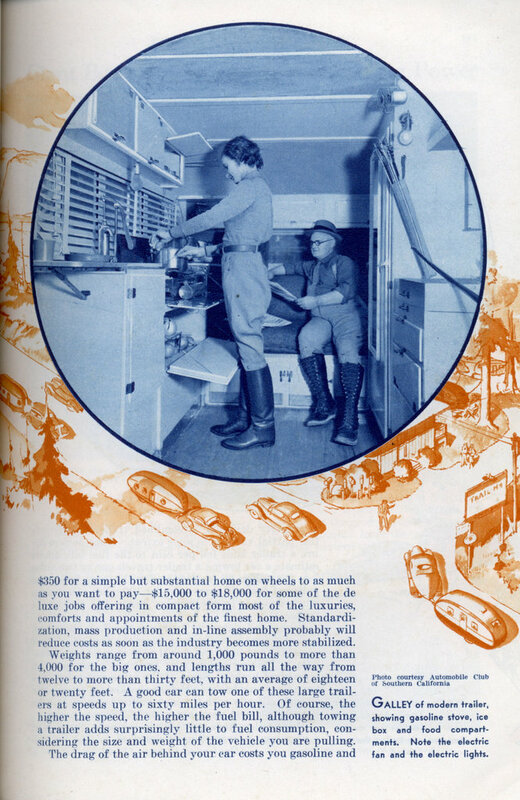 Often the ordinary car battery is unequal to the task, so some of the more elaborate units are equipped with a generator driven by a one-cylinder gasoline engine. In other units, a 110-volt circuit with an external outlet is provided to permit plugging into an outside source at auto camps where current is available. Adapter sockets for lights are used to allow the use of six-volt lamps where a 110-volt current is unavailable although some trailers have separate light circuits. Except for tire replacement, there is virtually nothing to wear out in one of these modern trailers. 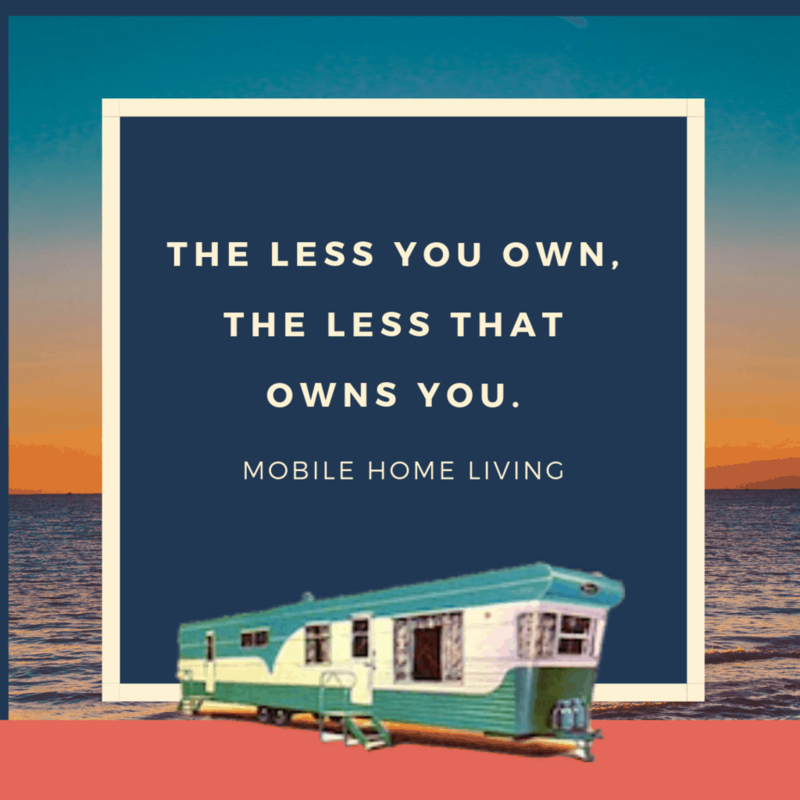 With reasonable care, a trailer coach purchased today should render adequate service for many years and represent as permanent an investment as, for instance, a summer cottage. 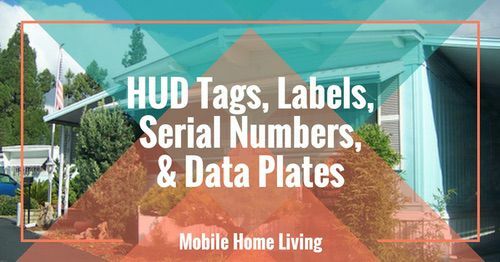 As a matter of fact, thousands of families have found these rolling homes offer all the advantages of summer cottages plus mobility something no summer home ever possessed before. 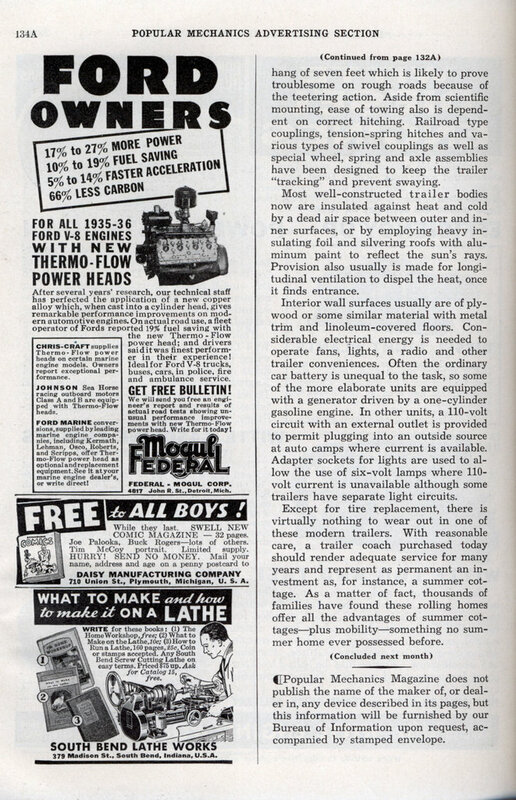 There are more great articles at Modern Mechanix, check them out here.